As elected officials, the Board of Trustees are the executives of our District. Trustees meet a minimum of once each month to approve, discuss and direct the Fire Chief in the operation of the District. Through the direction of President Evoy and the Board of Trustees, the Orland Fire Protection District staff is held accountable to the Board of Trustees for delivering the highest quality of services to our residents. 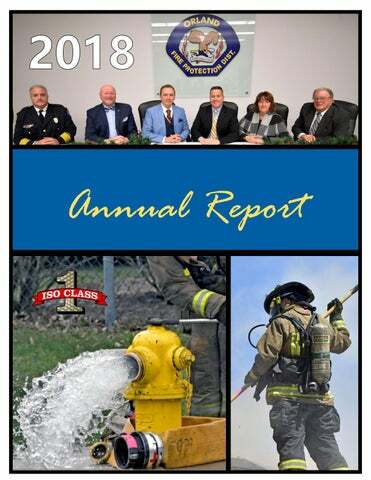 The accomplishments of our District in 2018 were the direct result of our Boardâ&#x20AC;&#x2122;s dedication to the Orland Fire Protection Districtâ&#x20AC;&#x2122;s mission of serving our residents. Board of Fire Commissioners The Board of Fire Commissioners are appointed by the Board of Trustees. The function of this Board is to conduct the testing of new firefighter candidates, promotional processes and potential discipline process. On Monday, February 5, 2018, Commissioner David Wagner attended his last Commissionersâ&#x20AC;&#x2122; Meeting. Dave Wagner served on the OFPD Board of Fire Commissioners since June, 2013. Fire Chief /Administrator Michael Schofield was appointed by and is held accountable to the Board of Trustees. He serves as the Chief Executive Officer and is the highestranking officer in the Fire District. He is responsible for aligning the entire Fire District with the vision of the Board of Trustees. Battalion Chief—Administration Nicholas Cinquepalmi manages the Orland Fire Protection District’s Administrative Services, which include: Fire Prevention, Dispatch, Information Technology and Officer Development. Battalion Chief—Operations David Piper manages the Orland Fire Pro tection District’s O peration al Services, which include: Suppression, Emergency Medical Services, Specialty Teams and Training. Command Staff Shift Battalion Chiefs Shift Battalion Chiefs are responsible for a shift of Firefighter/Paramedics. Each monitors and manages the day-to-day operations of our six fire stations on his shift. Each station has one Shift Lieutenant who reports directly to the Battalion Chief. The Orland Fire Protection District’s staff is dedicated to preserving life and property while valuing full accountability to each other and the people we serve. District News Orland Fire Protection District Receives Accreditation Status The Orland Fire Protection District is pleased to announce that we have received Accredited Agency status with the Commission on Fire Accreditation International (CFAI), becoming one of about 240 agencies in the nation to achieve the elite distinction. The District joins about 10 other agencies in Illinois that have received accreditation status. This is an important milestone in the continuing growth and success of the District. Accreditation shows our commitment to providing the highest levels of quality fire and emergency services to our residents, and the same high level of conduct in our business practices. Accreditation by the CFAI is proof of this commitment and signifies that we have met the rigorous standards of a nationally-recognized third party. We are proud to have met the challenge of accreditation, and intend to consistently uphold the principles of quality improvement and patient care in the future. District News Chinese Delegation Visit On August 28, 2018, the Orland Fire Protection District participated in a professional public affairs exchange program from China, and hosted 20 delegates from The Shanghai Delegation team for Regional Coordinated Development and City Planning and Management Innovation at our Training site. The team is composed of high-profile government officials from Shanghai Municipal. With diverse educational backgrounds and work experiences in finance, technology, public administration, social development, etc., the delegates were not only able to experience politics, culture and livelihood in the United States, but study various social aspects in technological innovation, urban planning/safety, government services, social security, environmental protection, etc. Visiting members participated in high-performance CPR demonstrations, Incident Command Training and Communications systems over a 3hour period. On October 6, 2018 the Orland Fire District was happy to participate in the Orland Home Depotâ&#x20AC;&#x2122;s annual Fire Safety event at their store. Some members of the Orland Firefighters Local 2754 pose with Santa & Mrs. Claus, with toys collected at LUNCH WITH SANTA--an event organized by the Orland Fire Protection District Wives and sponsored by OFPD & IAFF Local 2754. Attendees were asked to bring an unwrapped toy to support the OFPD Fire Prevention's annual toy collection to benefit the Toy Box Connection and the Pediatric Oncology Treasure Chest Foundation. District News Cure It Foundation's “Fire Up a Cure" On Saturday, July 21, 2018, Team Orland Fire reclaimed the 1st place trophy for the 2nd year running for the Fire Up A Cure competition to benefit pediatric cancer patients and their families. The first place trophy was presented to Chief Schofield by Firefighter Doug DePersia at the Board of Trustees meeting on Tuesday, September 25, 2018, and will remain at our Administration Building until it is up for grabs at next year's competition. Orland Fire Protection District’s Team, along with other teams, helped raise nearly $30,000 to help fund pediatric cancer research and help area families affected by this disease. Honorary Co-Captains Jack, Izabella & Ayden Visit Station 5 On December 18, 2018, the Orland Fire Protection District hosted a special Christmas station visit and dinner for the child captains of their "Fire Up a Cure" championship team. Jack Winkler, Izabella Marin and Ayden Semro were the guests of honor, and were accompanied by their siblings and parents. The evening included hands on experience with fire trucks, equipment, gear and a full station tour. The evening ended with dinner and gifts for all of the kids. OFPD is grateful for the opportunity to team up with these child cancer patients to help raise funding for childhood cancer research. Memorials Battalion Chief William Bonnar, Sr. Memorial On February 25, 2018, the District held a memorial service for Battalion Chief William Bonnar, Sr., a beloved member of the Orland Fire District. This date marked the 20th anniversary of Chief Bonnar’s death in the line-of-duty. Bill was born June 4, 1936 in Williamsport, Pennsylvania. He worked in the trucking industry and moved his family to Orland Park in the early 1960’s. On a chance remark, he volunteered for the Orland Fire District. He was one of the first Paramedics at Ingalls Memorial Hospital. He joined the Chicago Fire Department and was on some of the busiest ambulances for three years. Bill joined the Orland Fire District full-time in 1977. He rose to the rank of Lieutenant in 1981. He was a Shift Commander in 1989 and then became a Battalion Chief in 1990. He died in the line-of-duty, doing what he always enjoyed, training with his shift. Bill was known for a desire to learn and a unique passion for excellence and commitment to lead. He was proud of all his education and training, especially his Fire Officer III. Bill was a charter member of Local 2754 and its first President. In his 26 years at Orland, he saw the District change from rural to urban and volunteer to full-time. He loved his job, the Fire District and the fire service. A scholarship fund was established in his honor. Memorials 9-1-1 Remembrance Memorial On September 11, 2018, the Orland Fire Protection District held its annual memorial service to remember those who so tragically lost their lives to terrorist attacks on September 11, 2001. This yearâ&#x20AC;&#x2122;s ceremony marked the 17th year. Lieutenant Raymond C. Marquardt, Sr. Memorial On September 14, 2018, the District held a memorial service for Lieutenant Raymond Marquardt, Sr., a beloved member of the Orland Fire District. This date marked the 9th anniversary of Lieutenant Marquardtâ&#x20AC;&#x2122;s death from a line-of-duty illness. Ray was born in Blue Island, Illinois and graduated from Blue Island Community High School in 1957. He married Nancy Bomard at Salem Lutheran Church in Blue Island in 1959. Ray joined the Orland Fire District in 1967 and became full-time in 1977. He rose to the rank of Lieutenant and was in charge of the Fire Prevention Bureau for several years. He retired from the department in 1999 and died in 2009 from a line-of-duty illness. Ray was known for his love of Cushman Motor Scooters and fishing. He greatly enjoyed his time spent with his family and grandchildren. A scholarship fund was established in his honor. Awards Award of Merit Presented to Lieutenant Randy Reeder On September 13, 2018, the Orland Fire Protection District awarded Lieutenant Randy Reeder an Award of Merit for his outstanding performance in delivering the Orland Fire Protection District its ISO Class 1 Rank, as well as recognition as an Internationally Accredited Organization from the Commission on Fire Accreditation International (CFAI). Lieutenant Reeder’s outstanding ability to develop a program to produce a Standard of Cover, Strategic Plan, and Self-Assessment Manual, while striving for continuous improvement and coordination of personnel activities, allowed the Orland Fire Protection District to reach its goals and become one of 69 departments internationally to obtain the rank of ISO Class 1 and Accreditation Status. Lieutenant Reeder’s contributions have made the Orland Fire Protection District a more effective and efficient organization which has brought prestigious recognition to our District. GFOA’s Certificate of Achievement for Excellence in Financial Reporting The Certificate of Achievement for Excellence in Financial Reporting has been awarded to the OFPD Finance Director Kerry Sullivan by the Government Finance Officers Association (GFOA) for its Comprehensive Annual Financial Report for the fiscal year ending December 31, 2017. The Certificate of Achievement is the highest form of recognition in the area of governmental accounting and financial reporting, and its Pictured L to R: Mary Coughlin (Assistant Finance attainment represents a significant Director), Kerry Sullivan (Finance Director) and accomplishment by government and its Mary Jane Christ (Finance Assistant) management. The CAFR has been judged by an impartial panel to meet the high standards of the program including demonstrating a constructive “spirit of full disclosure” to clearly communicate its financial story. Congratulations to the OFPD finance team for receiving this award for the 10th consecutive year! Thanks to IL American Water for recently awarding the Orland Fire Protection District a grant that will help support the purchase of supplies and training for our â&#x20AC;&#x153;Stop the Bleedâ&#x20AC;? program being presented in local school districts. As in past years, their generous grants have helped us purchase important and relevant items to help our firefighters/paramedics do the best job possible. Unit Commendations On January 5, 2018, OFPD Paramedics responded to the scene to find an unresponsive male slumped over the steering wheel, unresponsive and had agonal respirations. The crew started CPR and found the patient to be in VFIB. The company immediately defibrillated the patient and performed advanced life support skills. The patient had ROSC in the field and was transported to Palos Hospital with a strong pulse and blood pressure. On January 6, 2018, OFPD crews responded to a nursing facility for a cardiac arrest. The company found a 79 year-old patient with CPR already being performed by RN staff. The crew performed ALS interventions and the patient had ROSC in the field within 20 minutes. The patient was transported to Palos Hospital. Unit Commendations On March 6, 2018, OFPD Paramedics responded to the residence for a 53 year-old male patient in cardiac arrest, with family members performing CPR. The responding personnel initiated high performance CPR and found the patient to be in VFIB. The Paramedics performed ALS interventions, including multiple medications and defibrillations. The patient experienced ROSC prior to leaving the scene and was treated and transported to Silver Cross Hospital. On March 10, 2018, OFPD Paramedics responded to a residence for a 22 year-old male patient in cardiac arrest. OFPD paramedics performed high performance CPR and ALS interventions. The patient converted through multiple cardiac rhythm changes during resuscitation efforts. The patient was given multiple medications, intubation and defibrillations and the patient experienced ROSC. The patient was treated and transported to Silver Cross Hospital. Awards Nights On both February 28, 2018 and September 13, 2018, the Orland Fire Protection District held its semi-annual Awards Nights to honor those receiving Unit Commendations for the period January, 2017 through June, 2018; as well as those celebrating a milestone anniversary with the Orland Fire Protection District for the period July, 2017 through September, 2018. Citizen Awards On Tuesday, May 22, 2018, Fire Chief Mike Schofield and EMS Coordinator Lieutenant Mark Duke presented the Chief Art Granat, Sr Award of Merit to Daniel Forde. This award is given for actions taken by someone who had no obligation to perform life-saving actions. They also presented TCO Gayle Enright with an Award for Excellence in Emergency Medical Dispatching. Lieutenant Duke explained that on March 29th Gayle Enright answered a 9-1-1 call from local high school teacher Dan Forde, who saw an elderly gentlemen in distress and reached out to get help for him. The two worked together to do what they could for the patient until OFPD Paramedics arrived a short time later. Unfortunately, the patient did not make it, but his family heard the 9-1-1 call and wished for them to be acknowledged and asked to be present when these awards were given out, which was done at our 5-22-18 Board of Trustees Meeting. On Tuesday, June 26, 2018, Fire Chief Mike Schofield and EMS Coordinator Lieutenant Mark Duke presented the Battalion Chief William Bonnar, Sr. Citizen Lifesaving Award to 3 members of Lifetime Fitness in Orland Park, for their quick action in saving a patron's life. This Life Saving Award is given for actions that directly save a life. On May 9, 2018, patron Michael Sanocki was observed having a medical event that resulted in cardiac arrest. LIFETIME employees Rickey Cruz, Jason Fox, Cooper Garland and Jerome Jasper administered CPR, called 9-1-1, applied an AED and defibrillated the patient. Their quick actions resulted in a successful resuscitation. Paramedics continued care and delivered the resuscitated patient to the ER with stable vital signs. On Tuesday, September 25, 2018, Fire Chief Mike Schofield and EMS Coordinator Lieutenant Mark Duke presented the B/C William Bonnar Lifesaving Award to Sara Warner and Cindy Drabeck, as well as Police Officer Warren Sekula. This Life Saving Award is given for actions that directly save a life. Dispatcher Desiree Breese received an Award of Excellence in Emergency Medical Dispatching and sworn personnel: Lieutenant Purtill, Engineer Eisel, Firefighter Erickson, Firefighter Thompson, Firefighter Frawley, Lieutenant Fontana, Engineer Walsh and Firefighter Zielinski received a Unit Commendation. Their combined efforts in July saved the life of Mr. Ikeda, while in cardiac arrest, and he wanted to personally thank each of them. OFPD By the Numbers The performance of emergency responders is often measured by the time it takes personnel to arrive on the scene of the emergency call. Many steps take place prior to the arrival of a Paramedic at your side or a Firefighter with a hose full of water. The steps include call processing time in the dispatch center, notification to the appropriate fire station, crews suit up and mount apparatus, response of apparatus from fire station to scene, arrival of personnel and assembling of equipment, and then intervention. Orland Fire District uses a national guideline as our benchmark of performance. The benchmark (NFPA 1710) is used throughout the country to measure performance of career fire departments. NFPA 1710 requires four-person companies on fire apparatus responding in a timely-manner to both fire and EMS calls. The fire department shall establish a performance objective of not less than 90% for the achievement of each response time objective. OFPD By the Numbers The Orland Fire District has continued to see an increase in the number of incidents to which it responds over the past ten years. Incident volume has increased 17.3% from 2008 to 2018. The density charts below depict the locations of Fire, EMS and Other incidents throughout the District. Areas shaded in yellow and red represent an increase in call volume in that area of the District. The red shaded areas had the greatest number of emergency calls during the past year. The Orland Fire Protection District utilizes a Computer-Aided Dispatch system that identifies the closest available unit in order to respond as quickly as possible to each emergency. All of our units are staffed with Paramedics and equipped to provide Advanced Life Support. This flexibility on response provides the best medical care to those in need. The dynamic response platform may result in a fire truck arriving before or in conjunction with an ambulance for medical emergencies. Regardless who arrives first, the combination of units brings up to five Paramedics to each emergency. If the emergency does not warrant all of the Paramedics, the extra Paramedics return, leaving the appropriate amount of help needed to address the situation. Currently the Orland Fire Protection District staffs a minimum of five ambulance crews, four engine companies and two truck companies daily, all staffed by Paramedics with Advanced Life Support equipment. Significant Incidents Kitchen Fire at McDonalds On January 13, 2018, the Orland Fire District responded to a call of a fire at the McDonald's Restaurant on 159th Street in Orland Park. A kitchen fire caused the restaurant to close for a couple days. No injuries were reported. Investigators are working to determine what started the blaze. The damage was contained to the inside of the building. Car Fire at Orland Park Mall Damages Nearby Vehicles On February 21, 2018, a vehicle fire at Orland Square Mall caused damage to three other vehicles. Orland Firefighters were called to the Orland Square Mall to the lower-level Sears parking lot at about 8:30 p.m. following a report of a vehicle on fire. Firefighters were on the scene within three minutes and reported that three to four vehicles were on fire, with one fully-consumed. The fire was controlled in about ten minutes and confined to the four vehicles. There were no injuries. The cause of the fire remains under investigation. Elderly Woman Dies in Kitchen Fire On April 6, 2018, Firefighters responded to a fire in an apartment building in the 7300 block of Paradise Lane. Firefighters/Paramedics responded to the incident and found a severely-burned elderly resident in the kitchen. Paramedics quickly treated the subject and transported her to Palos Hospital and she was then transferred from Palos Hospital to the Burn Center at Loyola Hospital, where she passed away. The fire was contained to the kitchen of the victimâ&#x20AC;&#x2122;s apartment. Firefighters believe that while cooking the victimâ&#x20AC;&#x2122;s clothing caught fire as she reached over the stove for some cooking utensils. The Orland Fire Protection District reminds people to use caution when cooking in the home. We always urge residents to refrain from wearing loose clothing which can easily catch fire; have a fire extinguisher nearby; and use safe cooking practices such as never leaving food unattended on the stove. Significant Incidents Barbecue Grill Sparks House Fire On May 8, 2018, the OFPD battled a blaze at an Orland Hills home. The fire in the 16800 block of South 92nd Avenue, was reported as a barbecue grill that caught on fire. Two Car in Driveway Start on Fire On May 10, 2018 at 5:05 a.m. OFPD responded to a call that two cars burst into flames while parked in the driveway of a home in the 15400 block of Edgewood. Firefighters broke down the front door to search for occupants of the house. It was later determined that the homeowners were not home at the time of the fire. The fire is under investigation. House Fire On June 15, 2018, OFPD crews responded to a 911 call of a house fire in the 15300 block of Jillian Road. An alert neighbor called 911 to report smoke and flames outside another neighbor's home. When crews arrived, smoke was billowing from a fire near the garage. Firefighters were able to stop the blaze just in time before it spread to the house. The fire was confined to the attached garage and it was extinguished within 15 minutes. Light smoke damage was noted inside the home. Officials said the fire appeared to have originated outside the garage, consuming debris from a floor refinishing project. No injuries were reported. The family was not home at the time of the fire. Orland Fire was assisted on scene by Tinley Park and Frankfort fire departments, with several other area fire departments covering Orland Fire stations. Walmart, Orland Hills Box Truck Fire On July 26, 2018, the Orland Park Fire Protection District responded to a 911 emergency call regarding a fire at the Walmart Super Center at 9265 159th St. in Orland Hills. Upon arrival, Firefighters found a fully-involved fire in a box truck parked against the store building in the rear parking lot, fire officials said. Large flames and a plum of black smoke filled the sky above the vehicles. Workers were on the roof making repairs when the fire started below. Customers and employees were evacuated from the 24-hour Walmart and to allow access to the workers on the roof. The blaze was contained in about 30 minutes. No injuries were reported. The damage to the vehicle and store was in excess of $100,000. On August 4, 2018, the OFPD was dispatched to an automatic fire alarm in the 9300 block of Hunter Drive. Upon arrival, crews began a search of two twelve unit apartment buildings. While searching 9310 Hunter Drive, crews found smoke on the third floor and forced entry into the apartments. Truck 4 and Ambulance 4 found an apartment fire well-involved. Crews made an aggressive attack and were able to confine the fire to one unit. The ceilings had already fallen in the fire unit and fire crews were able to keep the fire from getting into the attic. There were approx. 50 residents that needed to be evacuated and one resident had to be removed from the third floor by fire companies. That resident was later transported to Palos Hospital in stable condition. Residents were unable to stay in the building and had to be sheltered with the assistance of the Red Cross. Nine adults and ten children were displaced from the fire building. The Orland Fire District was assisted by fire companies from Palos, Crestwood, Tinley Park, Frankfort, as well as mutual aid departments filling in our fire stations. The fire is under investigation at this time. Full Still Alarm Fire On August 10, 2018, the OFPD responded to a reported house fire in the 14400 block of Mason Lane. Fire companies arrived on the scene and found heavy smoke coming from the sub-basement of a one and one-half story frame home. Orland Fire and Orland Park police officers arrived on the scene and found three residents still in the lower-level of the home. Two of the elderly residents were physically-disabled and unable to get out on their own. Orland Firefighters and Police Officers successfully removed the residents as well as two family dogs. The residents were evaluated by fire department ambulances at the scene. The fire was contained to the sub-basement with smoke damage throughout. The fire originated in the family's dryer and is still under investigation. Two elderly residents were relocated by ambulance to a sonâ&#x20AC;&#x2122;s home in Palos. Fire departments from Palos, Crestwood, Tinley Park, Mokena, Lemont and Frankfort assisted at the fire and filling fire stations. Patio Restaurant Fire On November 22, 2018, the OFPD was dispatched to the Patio Restaurant, 7830 159th Street, for an activated fire alarm. Initial arriving units reported smoke in the building. Crews went in with a hose and found a sprinkler head had extinguished a cooking oil fire in the fryers. A small amount of remaining fire in the ducts above was extinguished with water from the hose. It was noted the sprinkler had activated just as the fire began to spread to combustibles nearby saving the business from more extensive damage. Fire crews remained on scene for about an hour to remove the smoke from the building and investigate. The business owner was on scene and called in a crew to begin clean-up and repair equipment. Mutual Aid Orland Fire Protection District provides mutual aid to and receives mutual aid from other fire departments. Along with handling incidents within our own jurisdiction, Orland Fire is regularly-requested to assist surrounding agencies with their incidents. The request may be to cover a fire station for subsequent incidents or to assist with personnel and equipment on the scene. A single incident can be taxing to the resources of any fire department, which has resulted in mutual-aid agreements pre -arrangin g the assistance prior to an incident and specifying who responds with what personnel, apparatus and equipment. The Orland Fire Protection District is a member of MABAS (Mutual Aid Box Alarm System) Division 19. Emergency Medical Services Orland Fire District takes great pride in the services we provide to the communities of Orland Park, Orland Hills and Orland Township. Orland Paramedics may arrive at your emergency on fire apparatus and ambulances. The computer-aided dispatch (CAD) system sends the closest fire company and ambulance to guarantee help arrives as soon as possible. All of our Fire Apparatus carry Advanced Life Support (ALS) equipment, just like the ambulances, since 1996. All of our Firefighters are also Paramedics. Orland Fire District training is provided in a safe, non-threatening teaching-learning environment which will allows providers to:  Practice safely and effectively  Develop critical thinking and situational awareness  Implement psychomotor and communication skills  Encourage student role development to meet professional standards of care The use of simulation in training promotes patient safety and quality pre-hospital care. Clinical competency is validated while improving the efficiency of EMS providers. Situational awareness and safety is enhanced through simulation of potentially hostile or otherwise dangerous situations. Critical thinking is promoted and team concepts in patient care are developed using realistic simulation scenarios. In 2012, Orland EMS was the first suburb in Illinois to begin the implementation of High Performance CPR similar to cities like Seattle, Washington; Minneapolis, Minnesota; Phoenix and Tucson, Arizona, that have Cardiac Arrest save rates of up to 50%. That is a stark contrast to most communities that do not utilize the High Performance model and have save rates in the single digits. Orland Fire District had a cardiac arrest save rate of over 50% in 2018. Orland 9-1-1 Emergency Medical Dispatchers impact survival rates by giving CPR instruction over the phone. Every minute that CPR is not performed decreases the chance for survival by 10%. Our goal is to have every Orland resident trained in CPR and AED use. We provide CPR for the public free of charge. Our mission will permit us to continue providing the best EMS in the area even as call volume continues to rise. Our highly-trained and experienced Paramedics provide unequaled service utilizing the best technologies available. We are prompt, efficient and effective in bringing you the help you need and deserve when you call 9-1-1. Over 90 School District 135 staff have been trained and STOP THE BLEED kits have been placed in all District 135 AED cabinets, which was possible due to generous grants from the IL Dept. of Public Health for $3,900 and IL American Water for $1,000. Emergency Medical Services Rescue Task Force Training The Orland Fire Protection District Paramedics trained with the Orland Park Police, the Cook County SWAT Team and other outside agencies. This combined training with Orland Park Police, for 25 hours over 7 days, worked on building a cohesive group of law enforcement and fire personnel to save victims in the event of a manmade or natural disaster. Emergency Medical Services EMS Appreciation Barbecues The American College of Emergency Physicians (ACEP) was instrumental in establishing EMS Week when President Gerald Ford declared November 3 – 10, 1974 as the first “National Emergency Medical Services Week.” This annual observance continued for four more years and was then reinstituted by ACEP in 1982. Orland Fire District shows gratitude to the EMS providers by providing an annual cook out for three consecutive days for each of the shifts. We can never take a day off from providing service to our community but providing a meal and acknowledging a job well done is a gesture of appreciation that is well received. EMS Administrator Lieutenant Mark Duke does the cooking, with some help from the Fire Prevention Bureau Supervisor Mike Ercoli and Life & Safety Educator Betsy Dine. Much thanks to Administrative Assistant Joan Pickens who helps organize these barbecues, prepares the wonderful sides and desserts and makes sure it is the best it can be! Emergency Medical Services Teen Bridge Center The OFPD Firefighter/Paramedics visited the Bridge Teen Center for a presentation on what it takes to be a Firefighter, what a day in the life of a Firefighter looks like and why would anyone want to be a Firefighter. Next, there was a Questions & Answer period and then a guided tour of our fire apparatus, with an explanation of the equipment and a look at the protective gear. In addition, the importance of being prepared was discussed and how the students themselves can save a life. Lastly, the students learned/reviewed CPR and practiced what they learned. Calling (9-1-1) / Performing compressions /applying an AED was taught. Centennial Lifeguards Train With Orland Firefighters With summer comes swimming and the possibility of pool injuries. Orland Park Lifeguards train with Orland Fire District Paramedics each summer. Sudden Cardiac Arrest (SCA) can be defined as cessation of cardiac mechanical activity, as confirmed by the absence of signs of circulation.  Approximately 23% of SCA victims present with an initial rhythm of Ventricular Fibrillation (VF) or Ventricular Tachycardia (VT) that is an unorganized heartbeat.  Survival rates of over 50% can be obtained with early chest compressions (CPR) and electrical shock (defibrillation) of VF or VT.  Every minute that CPR is not being performed and no defibrillator is available decreases the victims’ chance of survival by 10%.  Nearly 70% of out-of-hospital cardiac arrests occur in the home where no defibrillator is available but CPR can be initiated while help is on the way.  The median age for out-of-hospital cardiac arrest is 66 years of age. In 2013-2017 Census Bureau statistics indicate 21.6% of the Orland Park Community was over 65 years of age or older. Over the next 15 years, it is estimated that the over 65 population will make up over 30% of the Orland Park population. The Community Cardiac Arrest Rescue Enterprise (CARE) addresses the emerging trend, saving lives by engaging the entire community. Emergency Medical Services Cardiac Arrest Survivors Celebration Dinner The Orland Fire District held its first annual Cardiac Arrest Survivor Celebratory Dinner on Thursday, November 15, 2018. We had a wonderful turnout of Village public officials, citizen rescuers, OFPD EMS personnel, hospital EMS coordinators, speakers, the press and, most importantly, the survivors themselves and their guest. It was a wonderful evening! The Orland Fire Protection District Training Division continues to be at the forefront of training that provides opportunities which challenge individuals in our all-hazard training curriculum. Our program outlines expectations, along with dedicated routes that map out an individual’s career path. Our Training program doesn’t stop there. It follows, assists and mentors seasoned employees to choose and follow a specific path to obtaining personal goals. Orland Fire Protection District continues to adopt the certification/re-certification program through the Illinois State Fire Marshal Office (OSFM). Several of our members serve as subject matter experts that assist in the development of “task books” that are utilized as the road map or tool of maintaining one’s certification in a specific field. As of now, OSFM has identified 6 areas were recertification is required. This process repeats itself on a four year cycle. The Orland Fire Protection District is in the process of revamping our “3 year training plan” into a 4 year plan, to maintain consistency with OSFM, while still maintaining proficiency in all disciplines of our profession. Orland Fire Protection personnel have logged over 24,705 hours of training for the calendar year with approx. 2,540 hours dedicated to OSFM certification or recertification programs. Training Incident Command Training The Orland Command Training Center (CTC) was once again a tremendously utilized training avenue. The CTC hosts a program, Blue Card Incident Management System. This system trains Incident Commanders both new and experienced in hazard zone management. This Command Training Center still remains the only one of its kind in our state. Surrounding MABAS divisions have requested training as well as departments from the Illinois/Wisconsin border have made the trek here. The CTC offers both initial training as well as the required recertification every 3 years. Blue Card simulation training coupled with actual fire ground (simulator or real) enhances fire ground officerâ&#x20AC;&#x2122;s appreciation in respect to looking at the whole picture. This training has standardized communications within the local MABAS divisions as well as improved our fire ground accountability. Illinois Fire Service Institute / Cook County Department of Homeland Security With yet another calendar year under our belt that is representative of the partnership made with Illinois Fire Service Institute (IFSI) and Cook County Department of Homeland Security (CCDHS), our training facility was extremely busy throughout the year. Constant communications with both parties allows us to facilitate classes/courses which provide high quality training in all facets of firefighting, rescue, technical rescue and EMS. This thriving relationship has allowed approximately 1,355 personnel with 34,621 hours of training in a wide array of all-hazard training. With the success of last year, CCDHS is extending as well as increasing the annual budget, to provide additional training, to local departmentâ&#x20AC;&#x2122;s utilizing a cache of dedicated equipment while minimizing the total down time or service disruption. Vision The Orland Fire Protection District Training Division has a vision to develop a training organization that provides the highest quality training for the Orland Fire Protection District, as well as other departments throughout the region and state that utilize our campus/classes. Our training is structured to identify standard conditions, deploy standard actions, to deliver standard outcomes. Our state-of-the-art training props and facilities, virtual reality and scenario-based simulation centers, and quality instructors will provide training and certification. Training Training Facility The Orland Fire Protection Districtâ&#x20AC;&#x2122;s Training Facility has been the mecca of training for the past several decades. It is the nucleus that cultivates new recruits into experienced Firefighters, or allows young aspiring Firefighters that thrive to become an officer, the education, experience and motivation to accomplish that task. Our facility not only concentrates on the young, but also hones the skill of a seasoned Firefighter or experienced officer, which not only benefits them personally, but also demonstrates their capabilities, confidence and character on actual emergencies within our District or responding to mutual aid requests. Years ago, the Training Division had a vision and developed a master plan for future growth. One of our accomplishments this year was the construction of our grain bin prop. This bin (donated from a local farmer) was re-erected, filled with simulated material (donated plastic pellets) and utilized by the Combined Are Response Team (CART) for their annual validation of their rescue teams. While grain bin rescue is not unique to our profession, the setup and scenario provided teams with realistic and relevant tasks, but also had remained 100% safe. The up-keep of our facility/ props and development of new props, allows us to provide all-hazard training that is consistent to our profession and the changing times. Our goal for the Orland Fire Protection District Regional Training Facility has always been to provide to the most realistic training, while maintaining the highest degree of safety that also meets local, state and federal objectives. The Fire District, while maintaining its utilization of the OSFM certification programs, uses it as a platform to deliver training at a higher level than required. The Training Division, coupled with our Facility, will continue to be in the forefront, as a leader in training. Training Heavy Extrication Class With technology changing daily, OFPD continues to search for realistic, relevant and referenced training. Once again, Genesis Rescue Systems has sponsored a heavy extrication class that not only refreshes oneâ&#x20AC;&#x2122;s knowledge of rescue tools, but new methods of stabilizations, removal and innovative thinking or problem solving to the students. This course is offered to area responders with several OFPD members taking the opportunity to further their knowledge base. Another class out of the realm for responders is working with tow truck drivers. An outside tow agency held a class specific on up-righting various large heavy vehicles. The agency opened its enrollment for several of our fire companies to participate in the initial stages of stabilization of the vehicles prior to their arrival. This offered personnel a new perspective in the world of stabilization. Training Academy 2018 The Orland Fire Protection District hired 9 new Firefighter/Paramedics. The group began its orientation into the Fire District on March 2, 2018. Candidates began an intense 9-week academy to provide them with all of the skills necessary to be successful with the Orland Fire Protection District. The Academy provided each candidate with the opportunity to learn and practice their skills in firefighting, rescue and emergency medical services. The Academy was developed utilizing a blended learning approach and was comprised of three parts: an online component, a traditional lecture and a practical skills application. The new format of the academy allowed for a majority of the time spent demonstrating practical skills. The practical application allowed for each Firefighter to hone their skills necessary to meet the Orland Fire Protection Districtâ&#x20AC;&#x2122;s expectations. The fire service is a very physically-demanding profession. Each day began with physical fitness training. The physical fitness training provided a focus on functional movement and necessary skills to perform tasks associated with our profession. The fitness training increases fitness levels of our candidates, as well as prevents injuries. At the completion of fitness training, the candidates covered a variety of topics using the Illinois State Fire Marshal and National Fire Protection Agency as a framework. All the candidates successfully passed the academy and were released as probationary Firefighters. The probationary Firefighters function under the direction of a Company Officer. The Company Officer is able to continue the training of the new probationary Firefighter for the year following their start date. The Firefighter becomes a sworn Firefighter at the completion of the academy and one-year probationary period. Swearing In of Probationary Firefighters The Orland Fire Protection District hired 6 new Firefighter/Paramedics for our 2017 Training Academy. The group began its orientation in April, 2017 with an intense 9-week academy to provide them with all of the skills necessary to be successful with the Orland Fire Protection District. All the candidates successfully passed the academy and were released as probationary Firefighters, functioning under the direction of a Company Officer, as they worked to complete their one-year probationary period. All 6 candidates successfully completed the probationary period and were sworn in on April 5, 2018. The Oaths of Office were administered by Fire Commissioner Brian Oâ&#x20AC;&#x2122;Neill. The Orland Fire District has 18 members that are part of the MABAS 19/22 Water Rescue and Recovery Team. Our team responds to all water - related incidents involving rescue or recovery within the MABAS 19/22 jurisdiction and beyond on an as-needed basis. This response area covers about 450 square miles, which includes a variety of water ranging from numerous retention ponds, rivers and navigational water ways. Water Rescue & Recovery MABAS 19 Dive Team Our team responded to 10 incidents in 2018. These incidents included multiple calls for cars into ponds, utilizing sonar and divers to assist local Police Departments in evidence recovery operations, and assisting Channahon in a search for a missing boater. Looking ahead to 2019, the team will expand training on our sonar units which will include a newly-purchased high definition side scan sonar. These sonar units are utilized to help locate victims or objects of interest quickly, minimizing the amount of time a diver needs to be in the water. We will also be focusing on our swift / flood water training for all team members. In 2018, the Orland Fire Protection Districtâ&#x20AC;&#x2122;s Technical Rescue Team was dispatched to incidents which consisted of a tractor/ trailer into apartment in Lansing; Man vs Machine in Lemont; and a trench rescue. The remaining responses in the District were for vehicles that had impacted structures, causing a partial collapse of the structure. The OFPD emergency response personnel assessed the structural damage and constructed the appropriate shoring system. These actions allowed the residents to continue to occupy the structure until permanent repairs could be made. In 2018, multiple hurricanes along the east coast left many residents displaced from their homes. The Blue Team, which consists of OFPD and 8 other departments, was placed on standby to deploy. Our assignment was placed as a Heavy Rescue Team to search and rescue individuals trapped in large concrete structures. The Orland Fire Protection Districtâ&#x20AC;&#x2122;s Technical Rescue Team faces many challenges logistically on an annual basis. The Technical Rescue Team is made up of multiple disciplines. Each of the disciplines requires an array of different tools and techniques to search for and rescue victims. All of the tools need to be maintained and updated both for efficiency and the safety of the operator. We have been very fortunate to be able to acquire a valuable cache of equipment to serve the citizens of the District and provide for the safety of the team members. Now that Orland Fire is ISO 1 and Accredited, we need to maintain a team ready to deploy in a safe manner with proper equipment. A lot of the current members of our Technical Rescue Team are reaching retirement in the near future. To be deployable to assist other rescue teams, Mutual Aid Box Alarm System has a standard of 20 members per color team. As senior members retire, the team must replace members with younger members. It takes approximately three years to achieve all the certification to be deployable. The CART Central Board has developed a standard training program to assure that all Central Board technical rescue teams stay proficient in all disciplines at the technician level. This 4-year training program is based on achieving approximately 100 hours of training within each of the 10 disciplines. This is a very difficult challenge for the Technical Rescue Team every year considering training for any discipline or department is financially driven. The Office of the State Fire Marshal is changing a lot of their curriculum for the disciplines. With this change they are adding continuing education to maintain individual certifications. Research has proven that if a skill is not practiced within a 90-day period the individual begins to lose proficiency. We as a team will have to be creative with our training. As weather becomes more devastating the more the need will be for technical rescue teams. A well trained team means a more efficient rapid search and rescue of a victim. Technical Rescue Team Our new members have obtained 880 hours of grant-funded training through the Illinois Terrorism Task Force (ITTF). The training was in OSFM certification rescue courses. We were able to recoup tuition, salaries and any back-fill overtime. ITTF funds for training are becoming scarce which is going to make for another challenge in the near future. New team members will have to cover their own time off and will not get paid overtime. Therefore, teams will have to make sure that members are covered under the department insurance in case of any injuries. Training is very physical and demanding. The course instructors and the CART Central Board will have to get together to assure that students will stretch and perform smart to prevent injury. This is a culture change for a lot of individuals, but the career of a Firefighter is very demanding. We need to make a conscious effort to assure change when it comes to stretching and mobility to assure injury prevention which will lead to a healthy retirement. Validated 22 team members in Grain Bin – Technician-level Grain Bin during annual C.A.R.T. validation. The Orland Fire Protection District's technical rescue team and its members continue to be leaders of technical rescue throughout the state and Chicagoland area. The Hazardous Materials Bureau spent 2018 preparing for the changing hazards to the area. Time was spent on training members on equipment, best practices and new hazards. The challenge is to continue to prepare for response to Hazardous Material calls small and large. From Carbon Monoxide calls to leaking tankers, the Haz Mat Bureau prepares the members of the department to identify and initiate the correct response. We continue to improve the equipment and 12 hours of continuing education of all members. Those at the Technician level receive additional education and classes to improve the understanding of new hazards and equipment. The new technician class is 80 hours over two weeks. All technicians need an additional 12 hours of training each year. A select few volunteer to be members of the Southwest Hazardous Materials Response Team and at least six more drills and classes to further develop their understanding to hazardous materials response. The classes were provided with the cooperation of the Cook County Homeland Security Emergency Management Agency and Illinois Fire Service Institute. Additional training and drills were with the Mutual Aid Box Alarm System (MABAS) for equipment updates and refresher training. Also there were events with local pipeline companies and Cook County Department of Public Health. Illinois Task Force 1 – Urban Search and Rescue Team 2018 IL-TF1 is a state team formed of first responders and specialists from around the State of Illinois. The Orland Fire Protection District currently has seven members that assist with team operations. The team has 210 members divided into three teams of 70 personnel who are on call for one month. The team follows the organization guidelines and equipment requirements of FEMA USAR teams. Members of the Fire District who are currently on the team are: Lieutenant Purtill – Rescue Manager, Engineer Marquardt – Rescue/Heavy Rigging, Lieutenant Fontana – Medical Specialist, Battalion Chief Moore – Planning Team Manager and Firefighter Ritchie –Structural Specialist. New to the team this year are Firefighter Chad Erickson and Firefighter Mark Hogan as Rescue Specialists. Lieutenant Scott Olinski stepped away from the team in May after 15 years to focus on his new role as Orland Training Officer. Each member attends drills during the year, in addition to department training for nearly 100 hours of training. Training for 2018 included monthly drills and additional topics for Rope Tech, Swiftwater and a FEMA Structures Specialist. All members participated in the April multi-agency exercise in Chicago and Champaign. In September, 2018, IL-TF1 deployed an 18 member Type 1 Swiftwater Team to North Carolina for Hurricane Florence. While no Orland members were deployed, several were used to support the deployment with planning, processing and in the Task Force Operations Center. Cook County Overdose Prevention To establish guidelines and regulations governing the distribution and utilization of EVZIOÂŽ, the auto-injector form of Naloxone, to police departments throughout Cook County with the objective of reducing the number of fatalities due to opioid overdoses. With the help of Cook County (17th District) Commissioner Sean Morrison, the Orland Fire District has developed a policy which provides training to the police departments throughout Cook County. Commissioner Morrison and the Orland Fire Protection District applied for and received a grant to help with the epidemic of overdoses throughout Cook County. Training is provided by Orland Fire Protection District and meets all guidelines. This program is recognized by the Illinois Department of Services Division of Alcoholism and Substance Abuse. To learn more about the Public Act 096-0361 go to www.ilga.gov. does not take the place of emergency medical care. Get emergency medical help right away after the first dose of EVZIO, even if the person wakes up. effective in children for known or suspected opioid overdose. It is used to temporarily reverse the effects of opioid medicines. Communications/Dispatch Additional CAD upgrades have proven to save seconds off call processing time. While this saving is passed on to the responding departments for an overall better outcome on all incidents. With AVL equipped vehicles, Orland dispatches the closest emergency vehicle to the scene of an incident regardless what â&#x20AC;&#x153;stillâ&#x20AC;? district it may be. With these improvements, Orland was able to improve its ISO rating to a first class of one. In addition to the ISO rating, with help from the Communications Center, the District obtained national accreditation status for fire protection districts. The Dispatch Center is constantly looking at new technology to improve its call processing times. On May 22, 2018, TCO Gayle Enright received an Award for Excellence in Emergency Medical Dispatching at the Board of Trustees meeting. On 3/29/18, Gayle assisted a citizen helping an elderly gentleman in distress. The two worked together to do what they could for the patient until OFPD Paramedics arrived a short time later. Unfortunately, the gentleman passed away but his family heard the 9-1-1 call and wanted to personally thank them for what they did for their father. complex and quite challenging to maintain and repair. Given the nature of the fire service, this equipment is subject to extreme and less than ideal operating conditions which not only result in significant wear and tear but demand a very high and specialized level of technical skill. Orland Fire Protection District technicians possess a keen knowledge and understanding of auto and truck, mechanical, emission control and fuel injection systems, in addition to welding, fabrication, building maintenance, HVAC systems, multi-phase commercial electrical systems and communication systems. What sets our people apart is their level of expertise with the technical intricacies specific to fire, EMS, emergency equipment and building systems and maintenance. All equipment is serviced regularly and thoroughly maintained as part of the Orland Fire Protection District’s preventive maintenance program. The Support Service Bureau provides behind-the-scenes services that are essential to effective Fire, EMS, and Rescue Operations. Serving the community is the privilege of every Orland Fire Protection District employee, not only those responding to fires, EMS calls or other emergencies, but also those people behind the scenes repairing our facilities and fire apparatus, in addition to performing other essential functions. In the end, every Orland Fire Protection District employee fulfills a vital role that allows our organization to help others in times of need. Helping others is truly our privilege. Support Services Station 4 - Sleeping Quarters and Women’s Washroom Remodel The sleeping quarters and women’s washroom at Station 4 were extensively remodeled in 2018. These areas were original to the building (1988) and were in need of refurbishment. The vast majority of this work was performed by Orland Fire Personnel. The result is a finished product that has been professionally constructed, upgraded to current codes and standards and will serve the needs of OFPD personnel for many years to come. This project was completed in 45 days and was 23% under budget. Fleet Maintenance Fleet Maintenance General Repair and Maintenance – The OFPD employs two ASE certified Technicians who maintain approximately 60 pieces of equipment. All OFPD fire apparatus, ambulances and support vehicles are serviced at regular intervals, as well as annual certifications and testing. OFPD vehicles are extremely well-maintained which is imperative given the need for 100% reliability and the severe duty associated with emergency response. New Aerial Ladder Purchase - In December of 2018, the Orland Fire Protection District took delivery of a new, 2018, 100’ aerial ladder manufactured by E One Inc. This vehicle is equipped with a 1500 gallon per minute fire pump, a 400 gallon water tank, vehicle extrication equipment (“jaws of life”) and a full complement of Advanced Life Support (ALS) medical equipment. This vehicle and our highly-trained personnel are ready and equipped to respond to a very wide range of emergency situations from multiple alarm fires to a cardiac arrest. We are here to help the people we serve. SCBA/Tools/Hose/Supplies Self-Contained Breathing Apparatus Self-Contained Breather Apparatus are worn by Firefighters to protect them from inhaling toxic and super-heated gasses found in fires and hazardous environments. Compressed air is stored at a pressure of 4500 psi in cylinders worn on each Firefighter’s back similar to a backpack. Due to the extreme pressure and exposure to hostile environments, this equipment must be thoroughly tested and maintained. The OFPD practices a regimented routine of daily, weekly and annual testing, maintenance and repair of each SCBA. Hose Each OFPD fire engine carries nearly 3000 feet of various diameter fire hose. These hoses are designed to operate at pressures ranging from 80 psi to as high as 250 psi. Each length of hose is tested annually and repaired in house by OFPD personnel. Supply OFPD Support Service maintains an inventory of basic cleaning supplies and paper goods which are distributed to all facilities on a per order basis. The Orland Fire District Origin and Cause Team is responsible to investigate all fires that occur within the jurisdiction of the Orland Fire Protection District. The Fire District is mandated to investigate all fires and determine whether these fires were accidental or incendiary in nature. These fires include structures (whether occupied or vacant), vehicle fires, and all other types of fires (i.e. grass and rubbish). The Orland Fire District partners with our local police departments (Orland Park, Orland Hills, and Cook County) when a fire is determined to be suspicious or incendiary in nature. Intentionally set fires are criminal in nature and are set for a variety of reasons, such as personal or financial gain, as well as crimes against a person. Fire Investigations Cause Team trains to stay current on the latest techniques as well as staying on top of recalls and safety alerts that we can relay to our residents. In 2018, team members logged over 1,200 hours to satisfy state and local team requirements. This included classroom, seminar and monthly team training as well as online monthly training and fire investigations conducted by our team. In 2018, the Origin and Cause Team continued to see an increase in fires involving electronic devices. Many of these devices were left unattended and unsupervised while their batteries charged. We continue to experience fires involving clothes dryers and exhaust fans. Many of these fires could have been prevented by proper maintenance and servicing. We continuously work closely with manufacturers and our insurance partners to gather the latest and current information involving fire hazards. We continue to write articles warning residents on the dangers of bathroom exhaust fans as well as whole house fans. A rise in these fires continue to prompt the warnings. We also addressed dryer fires and cleaning vents as well as the dangers of trying to extinguish fires without notifying the fire department. We want our residents to get everyone safely out and located at their meeting place while calling 911 prior to attempting to extinguish any fire, no matter how small it may seem. We will continue to address current issues and fire hazards and put these messages on the districtâ&#x20AC;&#x2122;s website and Facebook posts so that our residents stay abreast on these important matters. Our Fire Investigators work with our residents to assure that they can get back on with their lives as soon as possible. We want them to know that we are there to assist them during the days and weeks to come. Our investigative team works with homeowners from the moment we respond to their incident until they are ready to move back in. It is often one of the worst times in their lives and we want them to know we are only a phone call away. We encourage all of our residents to reach out and call us when they are in doubt or have any questions regarding their claims. Juvenile Fire Setters Program The Orland Fire District Origin and Cause Team has three state-certified Juvenile Fire Setter Interventionists on our team. The goal of our interventionists are to work closely with law enforcement and parents to assist juveniles when a fire is suspected of being caused as a result of a juvenile. In 2018, the team responded to three call outs within the Orland Fire District to assist parents and law enforcement this year. Our program participants can be recommended to the team by parents, law enforcement and the juvenile court system. The program involves educating the juvenile and their parents on the dangers of fire and promotes fire safety. Parents accompany the juvenile throughout the training process. Fire Investigations Our goal is to help identify potential problems and help the family get additional help if needed. Our program is very successful and we have not had any reoccurrences involving juveniles that we have assisted. The team will be adding one additional interventionist next spring. Our fire setters formed a coalition with other area neighboring departments in 2018. This coalition allows its members to receive additional training and to be able to network with other departments with similar concerns and issues. This partnership allows us to work with other mental health professionals and gives us greater resources to better help our residents. Our team is on call for all task force call outs involving juveniles and their fires. Community Emergency Response Team (CERT) CERT is made up of volunteers that are residents of the Orland Fire District. The class teaches various topics including first aid, fire extinguishment, scene safety and disaster preparedness. The class participants have to take a written test as well as a live practical before obtaining their certification. The class is awarded a CERT backpack containing emergency equipment including a first aid kit and other tools to help mitigate an emergency, provided by the Board of Trustees of the OFPD. The Orland Fire District currently has 53 certified CERT team members and is looking to hold additional training classes in 2019. The CERT team continues to meet and hold additional training to better prepare the team for deployment in the event of an emergency within the Orland Fire District. The team will be able to assist the Fire District and perform many important functions. The members can open and staff shelters within the Fire District and have training on District facilities. Our volunteers are confident that they can and will be there in the event of any emergency within the Orland Fire District. The Orland Fire CERT team continues their partnership with the Village of Orland Park, Village of Orland Hills and the Orland Township to assist them in the event of an emergency. Our CERT members are ready and willing to help their neighbors and friends as well as neighboring communities. Requirements to become a CERT member within the Orland Fire District consist of the following considerations; you must be a resident of the Orland Fire District, willingness to participate in the nine week training program, and completion of the written test and class practical. The Orland Fire District Board of Trustees and Chief Michael Schofield are very proud of all our CERT team volunteers and their continued efforts to come to the aid of their fellow residents. It is a significant commitment to become a CERT member and be willing to volunteer in the event of an emergency. All team members are ready to respond in a momentâ&#x20AC;&#x2122;s notice. Finance The Finance Department is responsible for all financial activities and financial functions of the District, including preparing the annual budget and property tax levy, paying employees, paying vendors, collecting revenue, investing funds, recording receipts, expenditures, and other financial transactions, and preparing financial reports. In 2018, the District received the Certificate of Achievement for Excellence in Financial Reporting from the Government Finance Officers Association (GFOA) for the 2017 Comprehensive Annual Financial Report (CAFR). This is the 10th consecutive year the District has received this prestigious award. The CAFR can be found on the Districtâ&#x20AC;&#x2122;s website at www.orlandfire.org. Distinguished Budget Presentation Award The 2018 Budget document was submitted to GFOA for the first time to be considered for its Distinguished Budget Presentation Award and the District has been notified that the award has been received. 2019 Budget The 2019 budget document, which serves as the financial plan for the upcoming year, was further expanded from prior years and can be found at www.orlandfire.org. The costs to achieve the Districtâ&#x20AC;&#x2122;s mission are primarily offset by property tax revenue. Increases in property tax revenue are limited by tax rate ceilings and property tax caps. Other sources of revenue includes ambulance service fees, grant revenue, dispatch service fees, and fire prevention fees. The 2019 Budget gives priority to programs and services that provide the greatest benefit to District residents. The 2019 Budget represents the efforts of District staff in reviewing their operations, streamlining them when possible and investing in improvements to daily operations to benefit the safety of District residents and employees. A Capital Fund Five Year Financial Plan was developed in 2018 to help anticipate and plan for funding needs for capital items. As an overview, total revenue and expenditures for all funds combined for the 2019 Budget, 2018 Budget and 2017 Actual are presented below. Senior Advisory Council (SAC) The Senior Advisory Council’s mandate is to serve as a liaison between the District’s senior population and Fire District officials. The SAC also coordinates and sponsors educational programs for various groups of seniors including: homeowners’ associations, community groups and the public at large on issues that include safety tips, CPR training, Knox Boxes and 911 calls. SAC members also serve as volunteers at various Fire District events. Continued to work with OFPD Public Education personnel, Fire Prevention Bureau and other staff on promoting OFPD Programs such as CERT, Community CARE and CPR. Arrange for meetings with Firefighters, OFPD staff, Paramedics and fire house personnel to find out senior population concerns/needs from their interactions. It is the mission of the Fire Prevention Bureau to educate the community about the benefits of proper safety practices, and to identify and eliminate hazardous conditions which pose a threat to life, property and the environment. The Fire Prevention Bureau protects people by eliminating potential emergency situations before they occur. We use the term “proactive firefighting” to describe how we analyze new building plans in an attempt to anticipate potential life-safety issues. We also use this term to describe how we look for potential life-safety hazards while doing our annual inspections and bring them to the property owner’s attention. Our public education programs are designed to address current life-safety issues that we see occurring within the Fire District. Ultimately the goal of the Fire Prevention Bureau is to keep emergencies from occurring; thus keeping people out of harm’s way. We believe that Fire Prevention plays a crucial role in making our community safer. Inspection, enforcement and public education work together to not only identify and correct safety issues, but also to help change people’s attitude toward safety. Through the diligence and hard work of the members of the Orland Fire District’s Fire Prevention Bureau, we have been able to achieve our annual goals. We anticipate fiscal 2019 to bring greater challenges as we set loftier goals to ensure the safety of the public and our Firefighters. The Public Education Division delivers instruction throughout the District. The Fire and Life Safety Educator is responsible for coordination and implementation of the Department’s Community Public Safety Mission. The Fire and Life Safety Educator is responsible for the effective supervision and education of the different at-risk programs that are implemented throughout the District. The Fire and Life Safety Educator develops, coordinates, presents, oversees and evaluates each program throughout the District. Our goals and objectives are established each year and include curriculums and programs to reduce the risk of injury, harm or death. The District offers numerous classes and programs to help reduce community risk. Some of the programs that we offer are: First Aid/CPR, station tours, numerous school visits, camps, open house, show and tells, car seat installations, webinars, fire extinguisher training, fire drills, safety trailer lessons, senior citizen home safety, Coffee & Conversation, apartment/ condo safety, business evacuation planning and emergency preparedness. The District must follow the annual budget guidelines and all programs are approved by the Fire Chief and Board of Trustees. Coffee & Conversation This free program is held on the fourth Thursday of every month at the OFPD Administration Board Room. It is presented by the Orland Fire Protection District and Aishling Companion Home Care. Our mission is to continue to provide our community with resources to assist them in their everyday lives. The sole purpose and goal of our group is to provide current education by quality providers in and about our community. Fire & Life Safety Education Pilot Junior Cadet Camp New this year the Fire & Life Safety Education Coordinator, Betsy Dine, coordinated a pilot Junior Cadet Camp for children ranging in the ages of 13-16 years old. Our Junior Cadets were offered a glimpse of an opportunity to explore Fire Rescue & EMS. This class provided a combination of classroom and side-by-side training with our current Cadets and Firefighters. It was our aim that each Junior Cadet left with a better sense of responsibility and that he/she will be more accountable for their actions in their family and their community. We hope that by exposing the Junior Cadets to the skills of Firefighters and EMS and the rules that they must follow to achieve success, he/she will have a better idea about what it takes to become a successful individual in the future. Fire & Life Safety Education Kids Fire & Life Safety Camp Our Fire & Life Safety Education Coordinator, Betsy Dine, coordinates the annual Kidâ&#x20AC;&#x2122;s Fire & Life Safety Camp for children ranging in ages 8 to 12. Various safety topics are offered that create awareness and prevention of injury, harm or death. This camp was interactive and fun for the children. They learned all about unintentional injuries and how they can prevent them in the future. Fire & Life Safety Education Annual Open House Our annual Open House was held on Saturday, July 21, 2018 from 10 a.m. until 1 p.m. at the Fire District Training Center, 10728 W. 163rd Place in Orland Park. We had one of our biggest turn outs yet! An amazing amount of people showed up to see what our District does for them, as a community. The Open House featured a wide range of demonstrations showcasing how Firefighters address various emergency situations. Various fire apparatus used for emergency responses was on display, along with fire equipment used in responding to emergencies. A side-by-side scenario was set up to show our community how quickly fire grows, how working smoke alarms can and will save lives, and how sprinkled buildings will stop the spread of fire. The event featured free give-a-ways, Cook County Sherriff displays, Orland Park Police, Walgreens, Home Depot, Car Seats, kids face painting, Orland Chamber of Commerce, Aishling Companion Home Care, Bear Paddle, PLOWS, Eye Level Learning Academy, American Red Cross, Orland Township, CVS, Juice Plus, Living Well with Michelle, K-9 Comfort Dogs, CPR Table, Advocate Children’s Hospital, Cook County Sheriff Police 9-1-1 center, Orland Sportsplex, and kid’s stations galore. Donated once again was popcorn from Marcus Theatre. Our (SAC) Senior Advisory Council was on hand, as always, helping with everything, including a table with their own outreach information and material. Thank you to all who participated in this year’s event! Fire & Life Safety Education Senior Safety Christmas Luncheon On Friday, December 7, 2018, the Orland Fire Prevention Bureau held its annual Christmas Luncheon. This luncheon is a way to bring relevant safety messages to our local senior population while enjoying great food, live music and games. Winston’s Market catered this delicious meal. Nothing Bundt Cake, Orland Bakery and Houlihans graciously donated delicious desserts to each of our guests. Our guest speaker this year was one of our very own OFPD retired Lieutenant Chris Smith, who delivered some very useful and needed Seasonal Survival Guide information for the Senior Citizens. Aishling, from Aishling Companion Home Care, delivered a message to our seniors as to why it is important to attend our “Coffee & Conversation” group this upcoming year. Mike Meuris, the pharmacist from Walgreens, discussed why it’s important to get your shingles vaccine and stay up-to-date on all vaccines that are recommended. Dr. Lisa Gumina, a traveling audiologist, was our soloist during lunch, playing beautiful music while our guests enjoyed their holiday meal. Lori Gibson from Home for Life Advantage provided information to our Seniors. Lori is a Certified Aging in Place Specialist. She modifies homes for seniors so they can remain in their homes for the rest of their lives. Each guest left with some important information and a travel lamp to assist them at those times quick, convenient lighting is needed. Thanks to our Public Fire & Life Safety Educator, Betsy Dine, for all her hard work in planning and organizing this luncheon, as well as our staff and our Senior Advisory Council for all their help and hard work. selection, as well as the administration of our superior benefits that promote health, wellness and a sound work/life balance to the employees of the Orland Fire Protection District. Human Resources provides programs and services designed to support the OFPD and its employees in the achievement of the organization’s mission and objectives. In 2018, the Human Resources Division successfully launched multiple initiatives to promote an effective, efficient and equitable organization including expanding our professional development curriculum to include increased eLearning opportunities, webcasts and online job aids to increase employee engagement in professional development. Human Resources 2018 Promotional Processes Under the direction of the OFPD Board of Fire Commissioners, the Human Resources Department is responsible for the coordination and administration of all promotional testing processes for the purpose of creating promotional eligibility rosters for entry-level Firefighter/Paramedics, as well as the rank of Engineer, Lieutenant and Battalion Chief. These promotional processes are conducted in accordance with the requirements of the applicable Illinois State Statutes, the OFPD Board of Fire Commissioners Rules & Regulations, and the current CBA between the Orland Professional Firefighters Local #2754 and the OFPD. Promotional eligibility testing for entry-level Firefighter/Paramedic occurs every other year; Promotional eligibility testing for the rank of Engineer, Lieutenant, and Battalion Chief occur every three years, as negotiated between the OFPD and the International Association of Firefighters Local #2754. Human Resources will continue to ensure the highest levels of integrity and fairness in all promotional testing processes for the OFPD, for all concerned. The Orland Fire Protection District is an equal opportunity employer and a proud member of the Firefighters Diversity Recruiting Council. Hiring This year, the OFPD Board of Trustees instructed Human Resources to begin the background check process for nine (9) new Firefighter/Paramedic recruits from the current Firefighter Eligibility List. Eligible candidates must undergo a thorough background investigation process including criminal, state and federal check, a polygraph exam, a full psychological exam, fingerprints, employment verification, candidate interview, personal reference verifications, a complete physical evaluation by the Districtâ&#x20AC;&#x2122;s physician and drug screenings. After successfully completing the background investigation, which typically takes about four months to complete, the nine new recruits were welcomed at an orientation day held on Friday, March 2, 2018 for new-employee onboarding. On Monday, March 5, 2018, the new recruits began a 9-week training academy under the supervision of the OFPD Training Officer. The OFPD has a defined and supervised probationary process to evaluate new members. 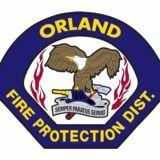 The Orland Fire Protection District utilizes a 12-month probationary period to evaluate new and promoted personnel. A formal performance evaluation based on demonstrated knowledge, skills, and abilities is conducted for each new Firefighter or promoted person after 12 months of employment or 12 months in the promoted position. Based on the Firefighterâ&#x20AC;&#x2122;s evaluation, the probationary period may be removed or extended. The probationary status for new-hire Firefighters lasts 12 months from their date of hire and ends with a probationary evaluation before they are cleared to regular Firefighter status. The written component of the Engineer Exam was held on October 29, 2018. Twenty (20) eligible candidates sat for the written exam, immediately followed by an optional scoring session/appeal session with the testing agency where candidates had the opportunity to challenge questions and find out their score. After the required 10 day waiting period where eligible candidates may claim preference points, final scores were tallied and the OFPD Board of Commissioners certified the final eligibility list on December 7, 2018. The list is good for three years. Only those candidates who achieved an aggregate minimum passing score of 70% were included on the Final Eligibility List. The new Engineer list will expire December 7, 2021. Labor Management Local #2754 Negotiations: The District negotiations team consisting of Chief Schofield, B.C. Cinquepalmi, Finance Director Kerry Sullivan, and myself, worked diligently to successfully negotiate a new labor contract with members of IAFF Local #2754. The negotiations team finalized language and OFPD Board of Trustees approved a new contract with IAFF Local #2754 at the regular meeting on May 22, 2018. We look forward to working together with the union, and remain committed in our shared efforts for a productive and collaborative process moving forward. To help employees maximize health, Human Resources continues to offer annual health screenings, assessments and coaching to all Firefighters, and now, full-time Telecommunicators, in an effort to provide early detection, a reduction of health issues, and to motivate employees toward living healthier lifestyles. In all areas of work, Human Resources firmly upholds the tenets of confidentiality, accountability and trust. HR offered a series of three Lunch & Learn informational benefits sessions to help employees, retirees, and those considering retirement, evaluate the available medical plan designs, and specifically, understand the costs of each medical plan, and explain how each medical plan works. These sessions were held in addition to regular open enrollment benefit sessions to help educate employees, retirees, and those considering retirement, evaluate their benefit options within the group medical plan designs. Workers’ Compensation HR oversees and manages all aspects of workers’ compensation for employees of the District. Over the years, we have experienced much frustration in the amount of time and red tape it takes to coordinate efforts simply to get our Firefighters the treatment/tests they need after experiencing a work injury. One of HR’s goals in 2018 was to work with the District’s physician to come up with new ways to reduce injuries, and get our Firefighters back to work quickly, while ensuring that they also are receiving the best medical treatment plan they need, followed by a clear path for them to transition back to full duty. Together with Chief Schofield, Training Officer Dave Piper and Dr. Wilson’s wonderful team, we came up with new cost-saving measures such as reduced pricing for certain medical tests for District personnel in order to minimize costs associated with lengthy workers’ comp metrics, well known throughout the State of Illinois. IPRF Grant: Due to our efforts in strategies and approaches to prevent and reduce loss-cost drivers, the Illinois Public Risk Fund awarded the District with a check for $32,762. The money will go to help cover costs associated with the Districts’ fitness program for sworn personnel. By redesigning work, sharing resources, and leveraging technology, we have reduced overtime costs, duplication and administrative work. An unexpected byproduct of this reorganization has been improved retention as individuals have more varied and broader responsibilities that make their work more engaging. The Division of Human Resources remains dedicated to our responsive and progressive organization and strives to maintain a culture of service excellence through effective training, technology and adapting to the changing needs of the community we serve. Promotions A promotional ceremony was held at the Orland Fire District on February 8, 2018. Russ Ricobene was promoted to rank of Lieutenant and Dave Popp and Matt Johnson were promoted to the rank of Engineer. Commissioner Brian O'Neill administered the Oath of Office. Congratulations to our newest Lieutenant and Engineers! 3 Lieutenants: Eng. Bob Griffin III, Eng. Dave Popp and FF Carl Jones 3 Battalion Chiefs: Lt. Dave Piper to B/C - Operations; Lt. Joe Moore to B/C Shift 1 (Black Shift) and Lt. Bill Leddin to B/C Shift 2 (Red Shift). Lieutenant Scott Olinski was recognized as he will fill the role of Training Officer previously held by Lieutenant Dave Piper. Former Shift 2 B/C Nick Cinquepalmi will now be B/C Administration. Congratulations to all! Honor Guard There are currently 18 members of the Orland Fire Protection District Honor Guard. Eight of those members are also involved with the AFFI State Honor Guard. The mission of the Honor Guard is to preserve the honor of fallen firefighters, and to post colors for promotional ceremonies and special District functions. Memorial Services in 2018 included the Battalion Chief Bonnar Sr. Memorial, the Lieutenant Raymond Marquardt, Sr. Memorial and the 9/11 Remembrance Ceremony. The Honor Guard also posted colors at two promotional ceremonies on February 8th and May 21st. Other Fire District events attended by the Honor Guard included posting colors at Awards Night, the Class of 2017 swearing in, the Cardiac Arrest Survivors Dinner and the Senior Luncheon. To prepare for these events the Orland Honor Guard Members participated in seven drills held throughout the AFFI Honor Guardâ&#x20AC;&#x2122;s 4th District. The OFPD Honor Guard hosted an AFFI Honor Guard drill on June 9th at the CTC for Honor Guard members throughout the State of Illinois. In addition, some Honor Guard members also participated in the September National Fallen Firefighters Memorial Service in Colorado Springs, and the Line of Duty Death Honors for Buffalo Grove Firefighter Hauber and Chicago Firefighter Bucio. Cadet Program The year 2018 was again an exciting year for the Orland Fire Cadet Program. As a result of Cadets being granted preference points by the Board of Commissioners on entry level selection for Firefighter/Paramedic positions with the Fire District, the Orland Fire Cadet Program has it's first Cadet being processed for a full-time position as a Firefighter/ Paramedic with the Fire District. In addition, the program continues to have Cadets successfully challenge and pass their State Certification for Basic Operations Firefighter through the Office of the Illinois State Fire Marshall. By providing the opportunity to obtain this certification to individuals between 16 and 21 years of age, the Orland Fire Cadet Program starts Cadets on a path to a successful career in the fire service. Currently, the program has thirteen Cadets that are diligently completing their didactic and practical objectives as they work towards obtaining their Basic Operations Firefighter certification in the very early parts of 2019. Cadets are responsible for completing their didactic learning online and then attending meetings on Saturdays held at the the Fire District's Training Facility to complete their practical objectives. As we move into 2019, the Orland Fire Cadet Program is looking to build on its successes from 2018 and continue to improve the program that is offered to its Cadets. The Cadet Program will be looking to take on new Cadets in the spring of 2019 after doing recruitment in both the local high schools and community colleges. Overall, the Cadet Program will continually strive to achieve its mission of providing individuals with a strong foundation to build upon as they pursue a career within the fire service. Staff Vehicles Staff vehicles are provided to the Fire Chief, Battalion Chiefs and bureau supervisors.